ACCRA, Ghana (AP) — Kofi Annan, a charismatic global diplomat and the first black African to become United Nations secretary-general who led the world body through one of its most turbulent periods, died early Saturday at age 80. Tributes flowed in from around the world after his foundation announced his death in the Swiss capital, Bern, after a short and unspecified illness. The statement remembered the Nobel Peace Prize winner as "radiating genuine kindness, warmth and brilliance in all he did." He died "peacefully in his sleep," the president of Ghana, where Annan was born, said after speaking to his wife. At U.N. headquarters in New York, the U.N. flag flew at half-staff and a bouquet of flowers was placed under Annan's portrait. Reflecting the widespread regard that won him a groundbreaking uncontested election to a second term, leaders from Russia, India, Israel, France and elsewhere expressed condolences for a man Bill Gates called "one of the great peacemakers of our time." "In many ways, Kofi Annan was the United Nations," current U.N. Secretary-General Antonio Guterres said. "He rose through the ranks to lead the organization into the new millennium with matchless dignity and determination." Even out of office, Annan never completely left the U.N. orbit. He returned in special roles, including as the U.N.-Arab League's special envoy to Syria in 2012. He remained a powerful advocate for global causes through his eponymous foundation. "I think that my darkest moment was the Iraq war, and the fact that we could not stop it," Annan said in a February 2013 interview with TIME magazine to mark the publication of his memoir, "Interventions: A Life in War and Peace." "I worked very hard — I was working the phone, talking to leaders around the world. The U.S. did not have the support in the Security Council," Annan recalled in the videotaped interview posted on his foundation's website. "So they decided to go without the council. But I think the council was right in not sanctioning the war," he said. "Could you imagine if the U.N. had endorsed the war in Iraq, what our reputation would be like? Although at that point, President (George W.) Bush said the U.N. was headed toward irrelevance, because we had not supported the war. But now we know better." Despite his well-honed diplomatic skills, Annan was never afraid to speak candidly. That didn't always win him fans, particularly in the case of Bush's administration, with whom Annan's camp spent much time bickering. Much of his second term was spent at odds with the United States, the U.N.'s biggest contributor, as he tried to lean on it to pay almost $2 billion in arrears. At the end of his Nobel acceptance speech Annan reminded the world why such pressure is necessary. "Beneath the surface of states and nations, ideas and language, lies the fate of individual human beings in need," he said. "Answering their needs will be the mission of the United Nations in the century to come." He shared his middle name Atta — "twin" in Ghana's Akan language — with a twin sister, Efua. He became fluent in English, French and several African languages, attending an elite boarding school and the University of Science and Technology in Kumasi. He finished his undergraduate work in economics at Macalester College in St. Paul, Minnesota, in 1961. From there he went to Geneva, where he began his graduate studies in international affairs and launched his U.N. career. Annan married Titi Alakija, a Nigerian woman, in 1965, and they had a daughter, Ama, and a son, Kojo. He returned to the U.S. in 1971 and earned a master's degree at the Massachusetts Institute of Technology's Sloan School of Management. The couple separated during the 1970s and, while working in Geneva, Annan met his second wife, Swedish lawyer Nane Lagergren. They married in 1984. In both cases, the U.N. had deployed troops under Annan's command, but they failed to save the lives of the civilians they were mandated to protect. Annan offered apologies but ignored calls to resign by U.S. Republican lawmakers. After becoming secretary-general, he called for U.N. reports on those two debacles — and they were highly critical of his management. As secretary-general, Annan forged his experiences into a doctrine called the "Responsibility to Protect" that countries accepted — at least in principle — to head off genocide, crimes against humanity, ethnic cleansing and war crimes. 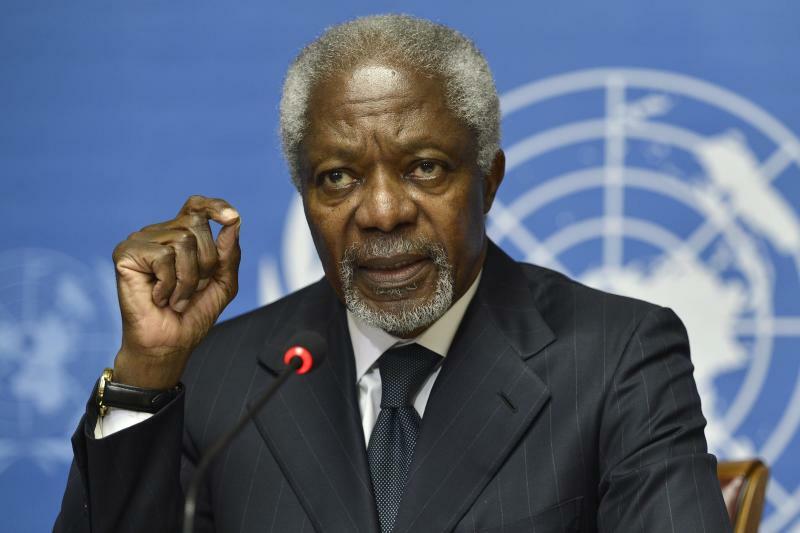 Annan sought to strengthen the U.N.'s management, coherence and accountability, efforts that required huge investments in training and technology, a new whistleblower policy and financial disclosure requirements. In 1999, he was deeply involved in the process by which East Timor gained independence from Indonesia, and started the "Global Compact" initiative that has grown into the world's largest effort to promote corporate social responsibility. 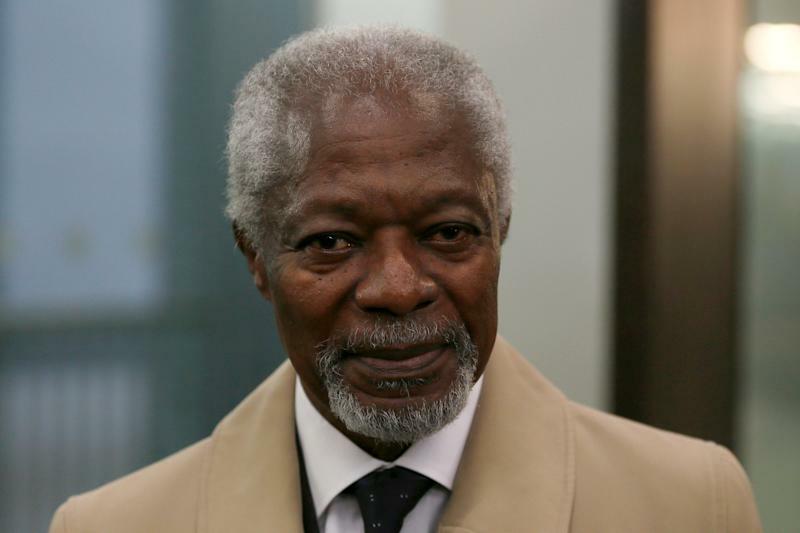 Annan was chief architect of what became known as the Millennium Development Goals, and played a central role in creating the Global Fund to Fight AIDS, Tuberculosis and Malaria and the U.N.'s first counter-terrorism strategy. Annan's uncontested election to a second term was unprecedented, reflecting the overwhelming support he enjoyed from both rich and poor countries. Timothy Wirth, president of the United Nations Foundation, which disburses Ted Turner's $1 billion pledge to U.N. causes, hailed "a saint-like sense about him." It emerged that Annan's son had not disclosed payments he received from his employer, which had a $10 million-a-year contract to monitor humanitarian aid under the oil-for-food program. The company paid at least $300,000 to Kojo so he would not work for competitors after he left. World leaders agreed to create an internal U.N. ethics office, but a major overhaul of the U.N.'s outdated management practices and operating procedures was left to Annan's successor, Ban Ki-moon. In his memoir, Annan recognized the costs of taking on the world's top diplomatic job, joking that "SG," for secretary-general, also signified "scapegoat" around U.N. headquarters. Former U.S. ambassador to the United Nations Richard Holbrooke called Annan "an international rock star of diplomacy." 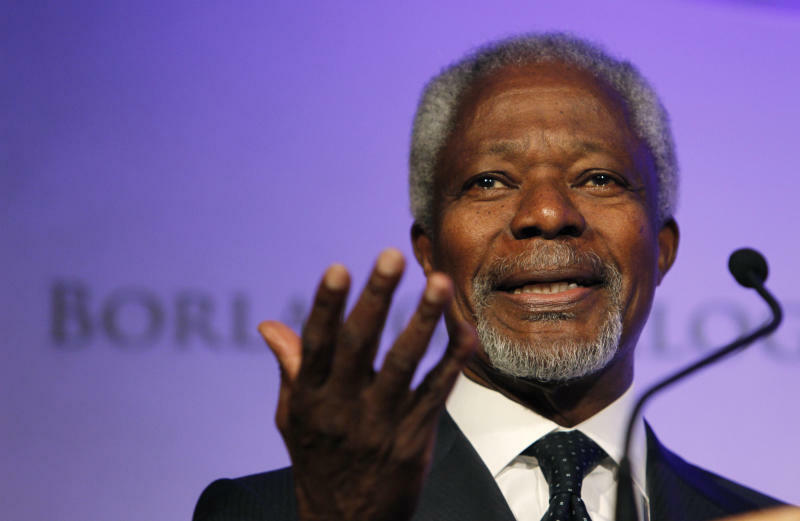 After leaving his high-profile U.N. perch, Annan didn't let up. In 2007, his Geneva-based foundation was created. That year he helped broker peace in Kenya, where election violence had killed over 1,000 people. Annan "represented our continent and the world with enormous graciousness, integrity and distinction," Tutu said Saturday in a statement, adding that "we give great thanks to God" for him. Annan continued to crisscross the globe. In 2017, his foundation's biggest projects included promotion of fair, peaceful elections; work with Myanmar's government to improve life in troubled Rakhine state; and battling violent extremism by enlisting young people to help. Like many in the international community he expressed alarm at the Trump administration's decisions to back out of the Iran nuclear deal and move the U.S. Embassy in Israel to Jerusalem. Annan retained connections to many international organizations. He was chancellor of the University of Ghana, a fellow at New York's Columbia University, and professor at the Lee Kuan Yew School of Public Policy in Singapore. His homeland of Ghana was shaken by his death. "One of our greatest compatriots," President Nana Akufo-Addo said, calling for a week with flags at half-staff. "Rest in perfect peace, Kofi. You have earned it." Annan is survived by his wife and three children. Funeral arrangements weren't immediately announced. Heilprin reported from Geneva. Associated Press writer Frank Jordans in Berlin contributed.